Sometimes, clients looking to purchase their dream home in Spain will be entirely focused on one particular complex. No other apartment will do. The small and exclusive Las Tortugas in Nueva Andalucía’s Golf Valley is one such apartment development. It’s easy to see why. The beautiful architecture is reminiscent of a traditional Spanish pueblo yet created with high quality materials and a modern finish. Likewise, Las Tortugas’ location is second to none, nestled in the hills of the Golf Valley and enjoying a peaceful tranquillity that is rare so close to the buzzing centres of Nueva Andalucía, Puerto Banús and Marbella. Within just a few minutes’ drive you can be hitting the designer boutiques, fabulous restaurants and world famous marina, not to forget the international schools and other essential amenities. But once you’re back in the peace and quiet of your Las Tortugas apartment, you could be forgiven for forgetting that you’re actually in the heart of the Costa del Sol and all it has to offer. 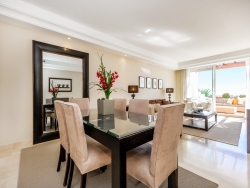 The elevated position of Las Tortugas guarantees superb views across Marbella to the sparkling Mediterranean Sea. The 60 two and three bedroom apartments and penthouses benefit from large terraces and roof terraces (penthouses) so you can make the most of the stunning vistas and mild climate for which the Golf Valley is known, while sipping on a pre-dinner drink or enjoying an al fresco meal with friends. Golfers will appreciate the much revered courses in the area, including Las Brisas Golf, Los Naranjos Golf and Aloha Golf. Each offers a beautifully maintained championship course with full service club house, restaurant, professional coaching and more. With sea views from many holes and stunning course design, the Golf Valley’s courses welcome members and return visitors every day of the year. Close by, Turtle Lake is another popular draw to this part of Nueva Andalucía. It’s pretty to walk or jog around this secluded lake and many families picnic there at the weekend alongside the regular fishermen and dog walkers. The well-proportioned, bright and airy apartments at Las Tortugas all benefit from contemporary bathrooms and kitchens, underground parking and lift access, as well as large communal swimming pools offering amazing views surrounded by manicured gardens. The popularity of Las Tortugas continues to grow thanks to its privileged location and picturesque environs, both with those looking to rent or invest in Golf Valley apartments. For more information on buying or selling your Las Tortugas apartment, speak to one of our experts at Nordica.